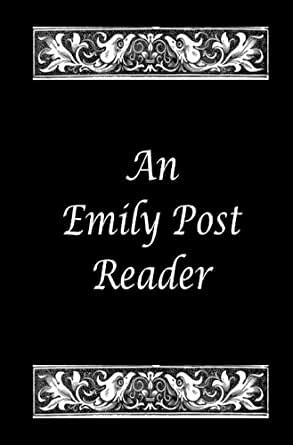 An Emily Post Reader (Baltimore Authors Book 20) - Kindle edition by Emily Post. Literature & Fiction Kindle eBooks @ Amazon.com. You know Emily Post as the famous author of the equally famous book on etiquette. But did you know that she was an accomplished writer in other genres, including novels and travelogs. All of them are represented here in this ebook, which has been reformatted to meet current ebook standards such as having an active table of contents. 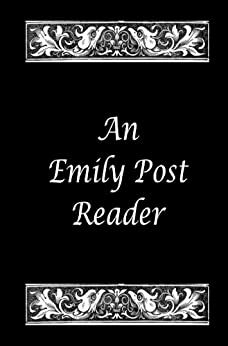 You know Emily Post as the famous author of the equally famous book on etiquette. But did you know that she was an accomplished writer in other genres, including novels and travelogs. All of them are represented here. While these works were written in the early twentieth century, they are still of interest today and are very much worth reading. Etiquette is as essential today as it was when Emily Post wrote the first edition of this revered work. "The Flight of a Moth" describes the descent of a woman in love with the right man and lives happily ever after. It has an interesting perspective on both contemporary mores and those of the early twentieth century. “Woven in the Tapestry” is an unusual fantasy, and in the opinion of the AfterMath staff, is far more interesting than most of the material printed in Galaxy and Analog during the golden age of science fiction and fantasy. “The Title Market” spoofs Emily Post’s own famous work on etiquette. “The Eagle’s Feather” describes the descent of a woman in love with the wrong man and does not live happily ever after, not at all. It, also, has an interesting perspective on both contemporary mores and those of the early twentieth century. “By Motor to the Golden Gate” is a travelogue that provides an interesting view of travel in America before the time of good roads, certainly far before the experience of the United States military in World War II showed the need for an improved transportation infrastructure. This gave the impetus for the Interstate Highway System and all the resulting development.